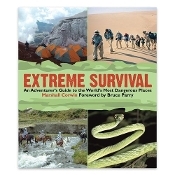 Extreme Survival is the essential guide for what you absolutely need to know before you visit out-of-the-way places. This is not a collection of requirements for traveling in the world's most inhospitable places. Rather, it is a compilation of first-hand experiences of the BBC's Serious Survival teams over the past six years—expeditions that have faced nearly every inhospitable habitat. For every budding traveler and explorer, Serious Survival is the most essential advice on what to do to ensure that you come back in one piece.